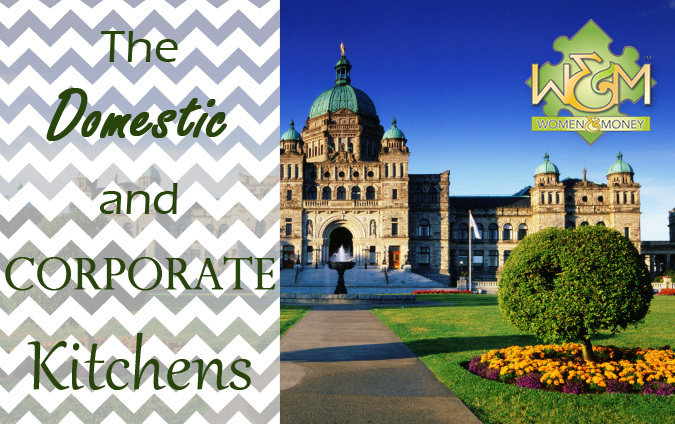 The Domestic and Corporate Kitchens - Women and Money Inc. The most recent flare up over the domestic and corporate kitchens, otherwise known as gender equality in the workplace, all began with the Minister of Justice’s Peter MacKay complaining that not enough women were applying for federal justice appointments. To many women this simply displayed an archaic attitude about women that dated back to the 1950s. Some members of the House of Commons suggested that this view was at least a century out of date. It’s difficult not to see the incredible blunder. The message is clear. Women work two jobs (only get paid for one) doing dishes and changing diapers, and the fathers shape the minds and futures of the next generation of leaders. This is a political and conceptual abomination of outrageous proportions. There are so many things wrong with this on so many levels. First of all, for me, it draws attention to how underrated care-giving for children and being a mother are. It clearly suggests that mothers play no role at all in shaping the minds and futures of ____ – the next generation of leaders, the next generation of accountants, the next generation of teachers, social workers? Why not simply say that mothers play no role in shaping the futures of their children? Is that not abysmal or even the ultimate disingenuous conclusion of the century? This kind of view lacks all credibility. Next problem is the presumption that only women care for children. Although far from equal, men have continuously assumed more and more domestic and care-giving duties since the 1980s. Moreover, for today’s middle and lower income families, both parents are working full-time jobs and scrambling to do the best they can with the little amount of time they have left for their children. Both working mothers and fathers struggle with some kind of balance between family life and corporate careers. Both working mothers and fathers have two-full time jobs… earning a living and caring for their children. Finally, the unpaid and underrated role of stay-at-home mothers and fathers or, in other words the disappearing art of parenting and care-giving in our society requires a great deal more analysis and understanding. The issue of unpaid stay-at-home mothers has been identified by many researchers and leaders as unfair and wrong to women. Their contribution to the family household has even been quantified by some as $115,000 per year. A stay-at-home mother’s job description most certainly would parallel any corporate management position. A mom’s profile would include counselling, teaching, listening, financial and family planning, operating and developing family budgets, market research (getting the best value for your dollar), preparing lunches, cooking, cleaning, laundry, washing dishes, changing diapers and providing moral support for all family members. Of course this list could be greatly expanded and many stay-at-home moms also earn extra income through home-based businesses. The point, however, is they are working. Stay-at-home moms work and work very hard – all of which contributes to the mental and physical well-being of the children and family. And, modern studies affirm that the care-giving process begins at conception and all through pregnancy. And, then after birth, the first six year period is exceptionally important as a prime cognitive-development period. In many respects what our society really needs is more stay-at-home moms and dads… to give the children the most precious gift of all – focused prime-time parenting. Perhaps what we need is equality between the corporate kitchens (boardrooms) and the domestic kitchens where children are the number one priority.